1. Please remove the PLASTIC CLIP on the cartridge. 2. And then remove the SEAL TAPE carefully before installation. 3. Insert the cartridges into the correct slot until you should hear a CLICK sound. Do not touch the chip. Please confirm your printer model before placing order. It would appear message such as Non-Genuine, please click OK or Continue, then it can go on to print. AFFORDABLE PRICE for HIGH YIELD ink is the smart choice for printing needs. SAMPLING INSPECTION prior to shipment delivers you reliable high quality ink replacement. BOX PACKAGE guarantees you receive properly handled and pristine cartridges. We use Amazon FBA fulfillment. Amazon will allow you to return the product within 30 days. If any requirement, please do not hesitate to contact our Customer Service (Contact Seller option under your order details), we will be glad to assist you with full technical, warranty, and general customer support. 1. 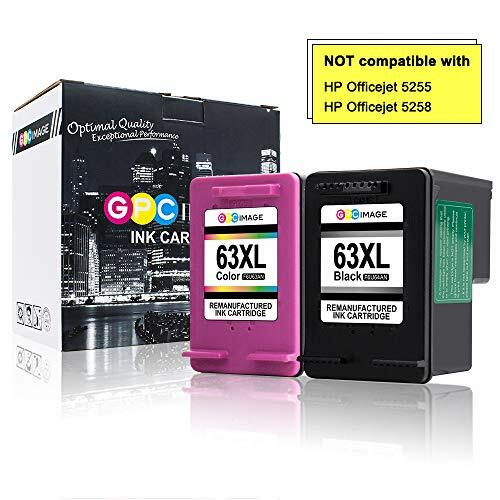 Our remanufactured replacement for HP 63 ink cartridges (high capacity) has New Generation Chips that provide complete ink level information. 5. Outstanding 90-day money-back guarantee & lifetime warranty. If you have any question, please feel free to contact us. (Contact Seller option under your order details). If you have any questions about this product by GPC Image, contact us by completing and submitting the form below. If you are looking for a specif part number, please include it with your message.